We are so thankful to have these wonderful people on the 3TSports Team, working diligently to train, compete, and increase awareness for our causes. Each has a story, and if their story inspires you, you can donate in support of their efforts. We were introduced to Gabe and his parents Michael and Angela by sponsoring an adaptive bicycle for them. Gabe hasn’t stopped pedaling since and has even completed a triathlon. Michael and Angela are incredibly supportive and workout right along with Gabe. Hayes was our second recipient of an adaptive bicycle thru MFF. Shortly after, getting the bike, he and his dad Jon completed their very first 10k race together. Jon continues to train and we are certain it’s only the beginning for this dynamic duo. Yes...those are 18 gold medals, 9 silver, and 1 bronze. That's a lot of hardware. Geordie is quite an accomplished swimmer, sports blogger, all around cool guy, and our first honorary 3TSports Team Member! He also spends a great deal of time working with McLindon Family Foundation. Amanda enjoys helping others, especially children. She joined 3TSports to help children become healthier, stronger, and live happy lives. Amanda is driven to help. "Every child deserves to live as normal as possible and participate in everday activities with a barrier free living environment." Carol has been a 3TSports Team Member from the very beginning. Carol is a multi-triathlon finisher and for years has competed to raise awareness for people and the causes that help them. No matter how tough the race, Carol is smiling the entire time...because she knows she's tougher. "I’ve been running since March 2014. A good friend of mine invited me to start training for a 5K and I haven’t stopped since. This year I set a goal to run a 5K every month, and so far, I’ve met my goal! I'm so excited to learn more about and be involved with helping special needs families." I am definitely passionate about helping children and I love the idea of being a part of something so special! I can’t wait to help raise funds and awareness and see smiles on the faces of these amazing kids! This seemed like the perfect team for me to join since Tripp inspired me to help more kids just like him!" Larry and Connie have a special place on the team. Everyone knows them as BoBo and MiMi or Tripp's Grandparents. They provide support in so many ways. Larry has even competed in multiple IRONMAN 70.3 events while Connie runs her own race, blazing around to encourage us. Alexis has Cerebral Palsy but does not let it define who she is. After 10 surgeries to lengthen muscles over her entire body, daily trips to the gym, therapy, and enduring the challenge of re-teaching herself how to walk every single day, she has completed 3 half-marathons and a 10K that she did for Tripp. Scott's story begins with his daughter who suffers from neurofibromatosis - a genetic disorder that causes tumors to form on nerve tissue. Scott knows there are so many others who are less fortunate, that are faced with the same challenges his family deals with daily. He continues his quest to inspire through competition and training, with the sole purpose of helping those who need it most. Bill is otherwise known as "Tripp's dad." His son, Tripp, got hurt in 2012 at only two years old. While playing outside at his daycare, a strong wind blew a tree limb down crushing his little skull. 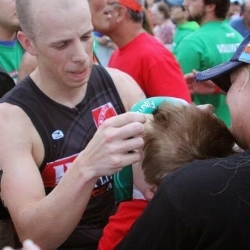 Bill signed up for his first Ironman in 2014 with a purpose that was bigger than him, bigger than Tripp, bigger than his family. He could help kids all over the United States get what they needed. Over past four years, Bill has met so many kids similar to Tripp. His heart swells up with love for the kids that fight so hard every day to get better. When Tripp's accident occurred in 2012, Stacy instantly became a full time wife, mother, care giver, and a champion to special needs families the world over. When Bill began his triathlon career, Stacy was his avid supporter at the races cheering him on. Over the years, Stacy also managed to pick up a healthier lifestyle, began running, riding a bicycle, and swimming. It wasn't long before she ran her first 5k, 10k, and half marathon. Stacy has a mission to pay forward the help and support they received, to others who need it most as part of Tripp's legacy.